Peppered moths are common insects living in England, Europe, and North America. They are small moths, only 1.5 to 2.5 inches across. Their light wings are “peppered” with small dark spots. Light and dark peppered moth larvae. Image by Rockpocket via Wikimedia Commons. Peppered moth eggs hatch during mid summer. 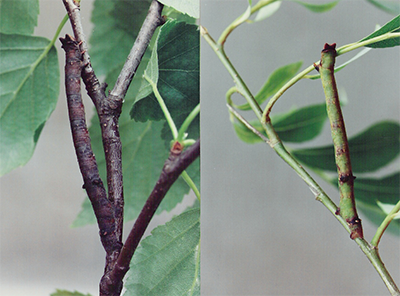 Larvae (caterpillars) feed on the leaves of birch, willow, and oak trees. The larvae look much like a small branch. Having a body that looks like a stick helps the larvae hide from predators. The larvae can even adjust their color from brown to green to best match the branches they are feeding on. Cold weather is difficult for insects. To avoid death, peppered moth larvae change into pupae (cocoons) for the winter. In April and May the pupae open to reveal a new adult moth. These adults will lay eggs and die by the end of summer. No peppered moth lives for more than one year. While the typical peppered moth is light, and is given the name typica, some moths have dark, almost black, bodies. These moths are given the name carbonaria. Others are somewhere in the middle and have many more dark spots than the light peppered moth. This middle color (or morph) is called insularia. In the past, darker moths were very rare. But that changed around 150 years ago. Continue onto the next section about natural selection to find out why. Light and dark peppered moth. Image by Martinowksy via Wikimedia Commons. 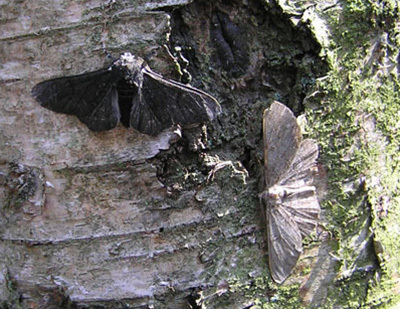 Predators of the peppered moth include flycatchers, nuthatches, and the European robin. Like most moths, peppered moths avoids predators that hunt in daylight by flying at night and resting during the day. Any animal sitting still is harder to see than a moving one. Peppered moths have extra camouflage to help them hide. The trees they live in have light-colored bark and are covered with small lichens, organisms that are part fungus and part algae or bacteria. The pattern on peppered moth wings looks very similar to lichens.